Most dogs like to chew. Some dogs are hard-core chewers and never recover from the puppy stage chewing. Chew toys come in many sizes, textures and shapes. But most of these, including rawhide chews offer no nutritional value. They may be entertaining, but there are better options you can give your dog for the same price. Of course, these are general statements and one should consult their vet if they are concerned about any conflicts with medications or conditions. Long lasting: Provided you purchase deer or elk antlers which have not been split, but are whole, deer antlers last much longer than traditional rawhide chews or bully sticks. But this does not mean you can let your dog run wild with an antler chew. No dog should be allowed to chew more than a half-inch or so per day. Antlers are a rich protein and too much all at once can cause stomach upset. High Nutritional Value: Unlike rawhide chews, deer or elk antlers are high in many needed minerals such as zinc, phosphorus, iron, calcium, magnesium and potassium. If you look carefully, these are many of the same ingredients in joint care tablets. Safe: Unlike cow or pig bones, deer antlers are unlikely to split leaving sharp edges that can hurt your dogs. When deer antlers are purchased whole, they stay supple and do not dry out and become brittle. However, no dog should be left wholly unattended when chewing antlers either. Sharp edges can occur and you may need to sand these down. Be sure to check the antler often to make sure there are not dangerous edges. 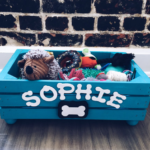 Various shapes and sizes: Since no two antlers are the same, your dog will feel like he or she is getting something new every time. It is important that you select the right sized elk antler for your dog so there is no chance of him or her swallowing it. Also, owners have to be sure to take the antler away from their dog when they have chewed it down so much that they could choke on it. Be sure to have a plan in place to get the antler away, like a piece of meat, cheese, or peanut butter. Humane and sustainable: Antlers are lost naturally each year. Thus, no deer or elk are killed just so your dog can chew! New antlers are grown each season. Generally, it is recommended that deer antlers are purchased from retailers who get their antlers from the USA as there is more control over quality and safety. 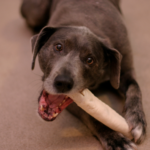 Preferred by dogs: Dogs seem to truly prefer the texture and smoothness of a deer antler. Perhaps this because it is closer to their wolf heritage! It may be difficult to get your dog used to chewing rawhides again after they have experienced an antler. Preferred by people: Deer and elk antlers do not smell or stain. Being odor free is a real plus for many people. And not trying to get those horrid reddish stains from rawhide out of the carpet or bedding is a great asset too. Deer and elk antlers are a good alternative to the poor quality rawhide chews often found in grocery stores. 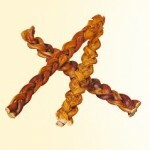 They are wholly natural and do not have any additives of preservatives and they are full of nutrition your dog needs. 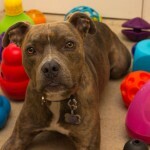 This is not to say that you cannot give your dog Kongs filled with their favorite treat or NylaBones. But there is no doubt your dog will harken back to his or her native spiritual state when he or she has an antler between their paws!